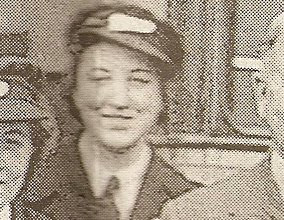 On Thursday I spoke to Stella Coulling (formally Stevens) about her experience of being a bus driver during the 2nd World War. Like many women during that time, Stella was called up and asked to take on work she previously had not considered. Stella told me that she had driven a bus during the blackout on a provisional licence and I couldn’t help but smile. I remembered struggling to take the MiDAS minibus test some years ago myself and passed the second time I did it . How much the attitude has changed and how much it had to change back then. Obviously it was a different world, a different time and I suspect that not as much traffic was on the roads. However, I wouldn’t fancy my chances, certainly not driving in a blackout! To think of somebody driving in blanket of darkness. It is hard for my generation and perhaps others generations, to imagine what people suddenly found themselves doing. Stella reassured me that your eyes grew accustomed to the night. I could only think back to stories I was told as a child and then as a teenager and into my twenties and thirties. The stories my Grandmother told me of her experiences and how the 2nd World War had changed her life forever. Stella told me that after the War she was given a full driving licence without taking a test. That the gentleman who gave her the licence said that he had sat on the bus as a passenger many times and knew she was careful and safe. I’d not heard of this before, I wondered if it had been some kind of temporary measure until systems were back in place. I looked up some information regarding the driving licence and found the following. In 1935 a driving test was introduced. Voluntary at first and then on 1 June, compulsory. The test was designed to ensure that each new driver had the competence to drive. 2nd September 1939 - Driving tests suspended for the duration of World War Two and resumed on 1st November 1946. During the war, examiners are designated Traffic Officers and supervise fuel rationing. 18th February 1947 - A period of a year granted for wartime provisional licences to be converted into full licence without passing the test. This must have been what Stella was referring to and had received her full licence during the period after the War. I really applaud her and wonder if I would have shown the same initiative in her shoes. Thank you Stella for taking the time to speak to me. (Funding is currently being sort to develop further archive and documentation).